Yes, Virginia, you CAN get pen pals from Postcrossing! This fantastic postcard came from a German postcrosser with whom I've struck up a correspondence, and she sends me AWESOME postcards like this one. 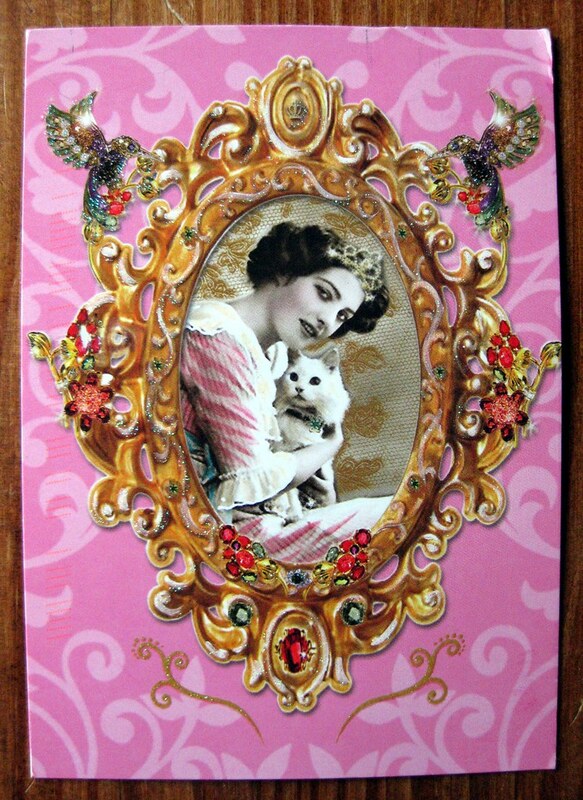 I love the photo of the crowned woman with her white kitty, and it's made even better by this sparkly ornate frame. ...but THIS stamp has to be one of my favorites ever! Happy lady cradling her mail! Love it! Does anyone know a little more about this stamp? I am just ever so fond of it. The caption, "...Post...Post...Post.." evokes that happy-mail feeling for me. UPDATE: The sender read my post and provided further info! 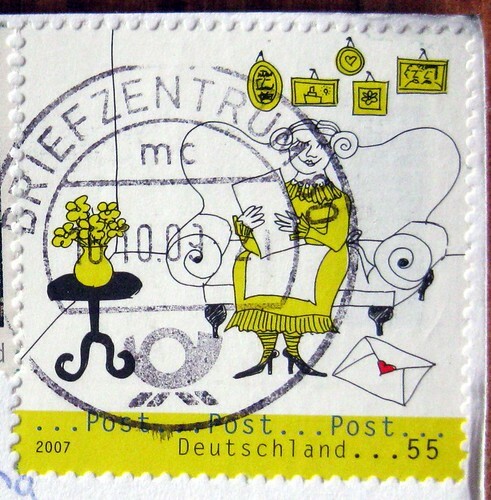 "The stamp is one from a series of a total of four stamps that German Post issued in 2007 to promote the advantages and joys of letter writing in our modern times. Below you can see the other three stamps. [She embedded the images in an email and I was unable to lift them for you here, sorry folks.] The one on your postcard is called “Recipient” and the ones below, from left to right, “Mailman”, “Mailbox”and “Sender”... put in the correct order they are supposed to show the way of a letter from being written, posted, delivered to being read." 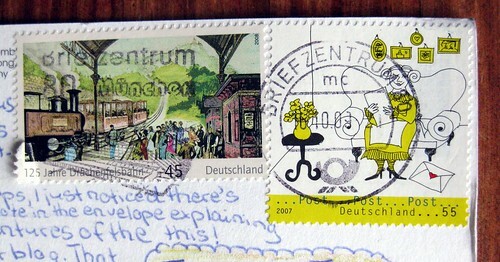 i have received stamps from the same *mail* series and i love them! that is an awesome stamp I love it too. Such a beautiful postcard and so nice stamps! Normally from Germany I almost only get small flower stamps.